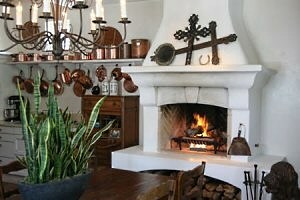 Fireplace Design Ideas, #04 -- How To Create A Cozy Country Hearth! 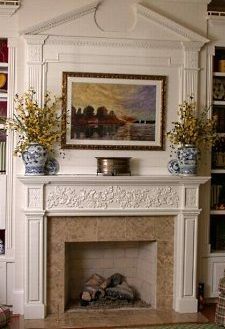 This month's Fireplace Design Idea Of The Month features the cozy country hearth . . . . and ideas about how to create one for YOUR home. 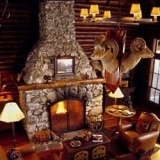 As you will see from the examples shown here, a cozy country hearth is a purely subjective term that means different things to different people. It can be fairly rugged, rustic and well worn . 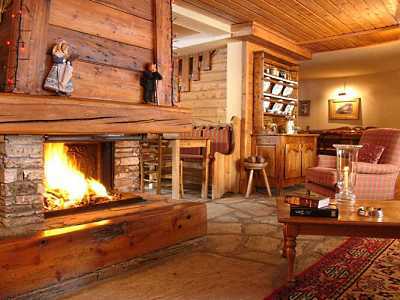 . . such as the warm and inviting example pictured above inside an old French farmhouse -- now part of Les Lauzes, a chalet hotel near Val D'isere in Southeastern France. It can also be a little less rustic and a bit more "refined," as shown in a few of the examples pictured further down the page. 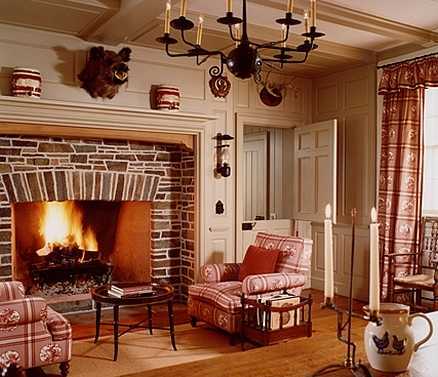 What is most important is what the term, "cozy country hearth," means to you. 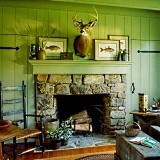 What level of rusticity or "refinement" gives you the look and feel that makes YOU most comfortable? And how will that look and feel fit into the style and overall decor of your room? Additionally, as with most of us, there may be budgetary issues that need to be considered. tured below is a masonry modular unit from Isokern, a 70 year old Danish company with manufacturing facilities in Europe and the United States. 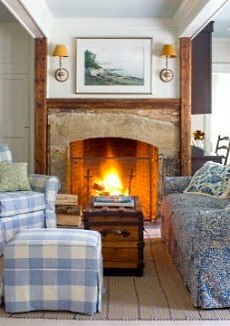 Despite its rather rugged appearance, the cozy country hearth pictured here looks "right at home" in its setting. 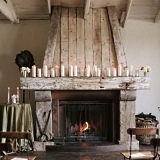 Framing the firebox opening are three large sections or slabs of stone which, in turn, are framed by rustic timbers. The void beneath the timber mantel shelf and above the arched stone slab over the firebox is filled with rubble stone. ering the furniture, as well as the neutral-colored rug on the floor. round with an arched opening. sign by Atlanta-based Harrison Design Associates. Country style curtains, seat cushions and chandelier lamp shades also pick up on the yellow color scheme used on the walls. and draperies pick up on some of the colors in the stone and mortar joints around the firebox opening. 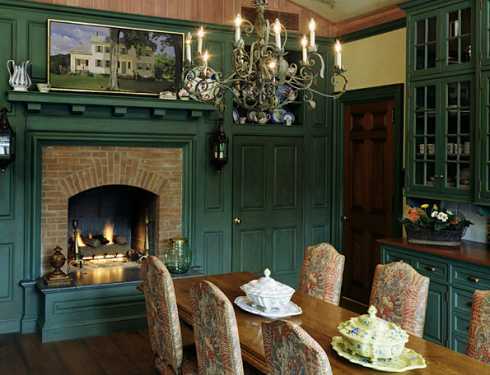 Designed by Ferguson & Shamamian Architects of New York City, the fireplace that follows is also framed by a paneled wall and crowned with a wood mantel shelf -- all of which are painted a lovely shade of green. A raised hearth and high profile mouldings frame the brickwork surrounding the arched firebox opening. 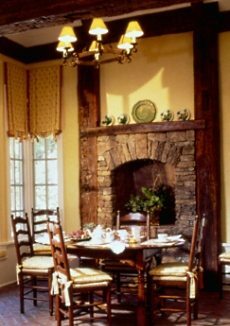 Though a bit more formal in appearance than the other designs featured here, it, nevertheless, has a warm and cozy country feel to it. trasts. Though the room has a rather casual and comfortable feel, it features a great deal of finely crafted and finished millwork throughout, including a beamed ceiling. 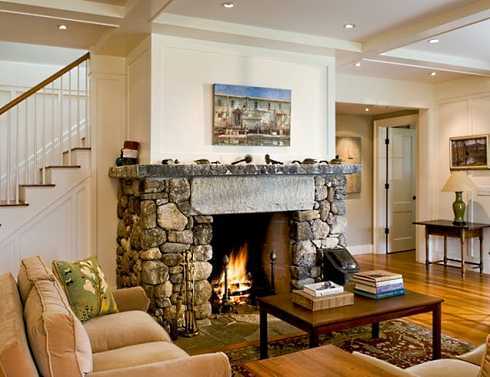 In stark contrast to that is the rugged and rustic stone fireplace surround, which really "pops out" in this setting! By Clicking On The Following Links! Surround By Extending It Upward!